Two remarkable modern heroes, were on the air with Dr. Gary Null. Null’s ‘Conversations With Remarkable Minds series. Both on this same hour show, a great listen. Gary Null is known as a take-no-prisoners health activist and author of several books including the recently published Reverse Arthritis & Pain Naturally. 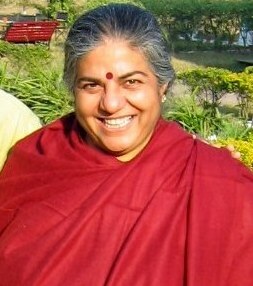 Dr. Vandana Shiva is a renown environmental and social activist, and formerly one of India’s top nuclear physicists. She is regarded as the leading pioneer behind India’s ecological and ecofeminism movement. In 1982 Dr. Shiva founded the Research Foundation for Science, Technology and Ecology, which led to the creation of Navdanya – an organization dedicated to the restoration of organic farming across India and the preservation of indigenous knowledge and culture. For several decades, Vandana has fought for changes in the globalized practices of agriculture and food. She has traveled the world speaking against biopiracy and patenting of indigenous knowledge by large agricultural and pharmaceutical corporations. Her activist efforts have created grassroots organizations throughout the developing world to counter genetic engineering of crops, as well as empower women throughout the third world. Born in 1934 in Durban, South Africa, Arun Gandhi is the fifth grandson of India’s legendary leader, “Mahatma” Gandhi. Growing up under the discriminatory apartheid laws of South Africa, he was beaten by “white” South Africans for being too black and by “black” South Africans for being too white. His grandfather taught Arun to understand nonviolence through understanding violence. Lynnea Bylund is managing director of Gandhi Legacy Tours, Director of Gandhi Worldwide Education Institute, founder of Catalyst House and has nearly three decades of experience in administration, marketing and business development. She was a nationally recognized spokeswoman for the emerging alternative video and information delivery industries. She has a degree in holistic health-nutrition from the legendary and controversial health educator and activist Dr. Kurt Donsbach, she is the founder of two not-for-profit small business-based wireless trade associations and has lobbied on Capitol Hill and at the FCC where she has spoken out strongly against the cable TV monopoly, illegal spectrum warehousing and ill-conceived congressional schemes to auction our nation’s precious airwaves to the highest bidder. Ms. Bylund is a founder and former CEO of a Washington DC telecommunications consulting and management company with holdings in several operating and developmental wireless communications systems and companies. In 1995 Lynnea became the first female in the world to be awarded a Broadband PCS operating permit – she was one of only 17 winners, along with Sprint, AT&T, and Verizon in the biggest cash auction in world history, raising a whopping $8 billion. Lynnea also spear-headed the successful effort to launch the first cable TV network in the South Pacific islands.